Want to be notified of new releases in yaricom/goNEAT_NS? This repository provides implementation of Neuro-Evolution of Augmented Topologies (NEAT) with Novelty Search optimization implemented in GoLang. The Neuro-Evolution (NE) is an artificial evolution of Neural Networks (NN) using genetic algorithms in order to find optimal NN parameters and topology. Neuro-Evolution of NN may assume search for optimal weights of connections between NN nodes as well as search for optimal topology of resulting NN. The NEAT method implemented in this work do search for both: optimal connections weights and topology for given task (number of NN nodes per layer and their interconnections). The Novelty Search optimization allows to solve deceptive tasks with strong local optima which can not be solved by traditional objective-based fitness optimization functions. One of such problems is maze navigation where non-objective search methods like novelty search may outperform more traditional objective-based search methods. Our goal in this research is to test this hypothesis. The source code written and compiled against GO 1.9.x. This project is dependent on goNEAT project which will be installed automatically when command above executed. An illustrative domain for testing novelty search should have a deceptive fitness landscape. In such a domain, a search algorithm following the fitness gradient may perform worse than an algorithm following novelty gradients because novelty cannot be deceived with respect to the objective; it ignores objective fitness entirely. A compelling, easily-visualized domain with this property is a two-dimensional maze navigation task, wherein an agent must navigate through a maze to a chosen goal point. A reasonable fitness function for such a domain is how close the maze navigator is to the goal at the end of the evaluation. Thus, dead ends that lead close to the goal are local optima to which an objective-based algorithm may converge, which makes a good model for deceptive problems in general. Moreover, by varying the structure of the maze and the starting and goal point of the robot, various classes of problems can be modeled (e.g. removing the exterior walls of a maze results in a more unconstrained problem). A maze agent controlling by Artificial Neural Network [ANN] must navigate from starting point to the exit within given number of time steps, i.e. in fixed time. This excludes dumb random search covering majority of maze locations which will take great amount of time steps to be executed. The task is complicated by cul-de-sacs that prevent a direct route and that create local optima in the fitness landscape. 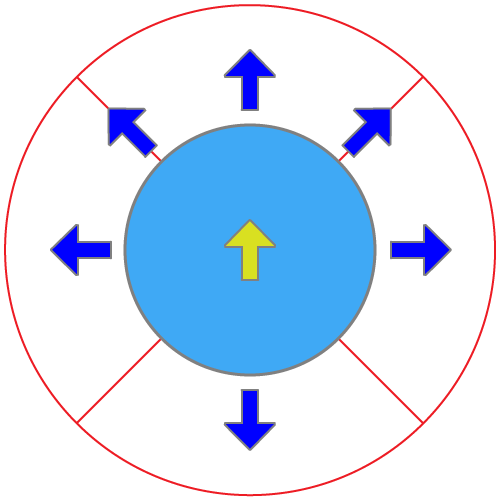 The agent has six rangefinders (blue arrows) that indicate the distance to the nearest obstacle and four pie-slice radar sensors (slices of red circle) that act as a compass towards the goal (maze exit), activating when a line from the goal to the center of the agent falls within the pie-slice. The radar sensors has following FOV zones relative to agent's heading direction: FRONT, LEFT, BACK, RIGHT, or in degrees relative to the agent's heading: (315.0 ~ 405.0), (45.0 ~ 135.0), (135.0 ~ 225.0), (225.0 ~ 315.0). The range finder sensors monitor following directions relative to the agent heading: RIGHT, FRONT-RIGHT, FRONT, FRONT-LEFT, LEFT, BACK or in degrees relative to agent's heading: -90.0, -45.0, 0.0, 45.0, 90.0, -180.0. The agent’s two effectors result in forces that respectively turn and propel the robot, i.e. change it's linear and angular velocity. 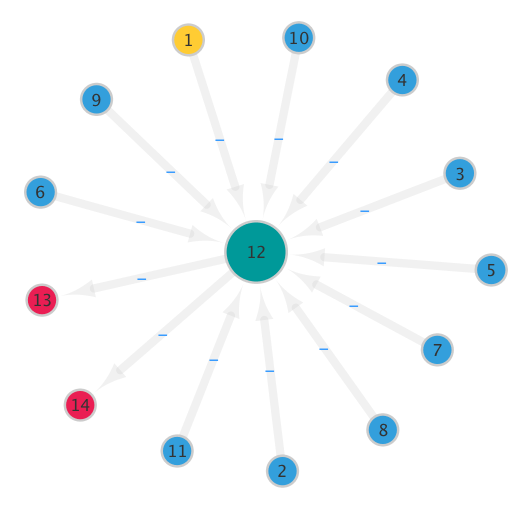 During NEAT algorithm execution with Novelty Search optimization the provided seed genome will be complexified by adding new nodes/links and adjusting link weights. In this experiment evaluated the performance of maze agent controlled by ANN which is created by NEAT algorithm with Novelty Search based optimization. The mentioned optimization is based on novelty metric calculation for each agent after particular time steps of maze navigation simulation for that agent is performed. The novelty metric biases the search in a fundamentally different way than the objective-based fitness function based on distance from agent to exit. The novelty metric determines the behavior-space through which search will proceed. Therefore, because what is important in a maze is where the solving agent ends, for the maze domain, the behavior of a navigator is defined as its ending position. The novelty metric is then the N-nearest neighbor distance novelty between the ending positions of all known solving agents. The effect of this novelty metric is to reward the robot for ending in a place where none have ended before; the method of traversal is ignored. This measure reflects that what is important is reaching a certain location (i.e. the goal) rather than the method of locomotion. Thus, although the novelty metric has no knowledge of the final goal, a solution that reaches the goal can appear novel. 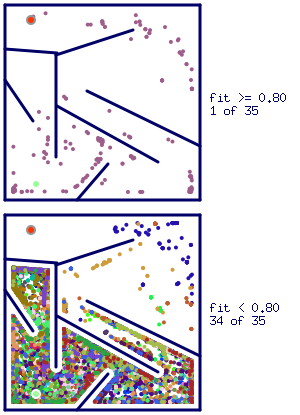 In addition, the comparison between fitness-based and novelty-based search is fair because both scores are computed only based on the distance of the final position of the robot from other points. Where: ./data/maze.neat is the configuration of NEAT execution context, ./data/mazestartgenes is the start genome configuration, and ./data/medium_maze.txt is a maze environment configuration. This command will execute one trial with 2000 generations (or less if winner is found) over population of 250 organisms. 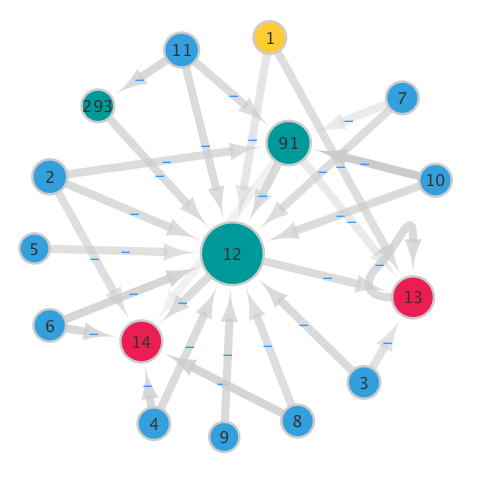 Winner nodes/genes is number of units and links between in produced Neural Network which was able to solve XOR problem. Winner evals is the number of evaluations of intermediate organisms/genomes before winner was found. 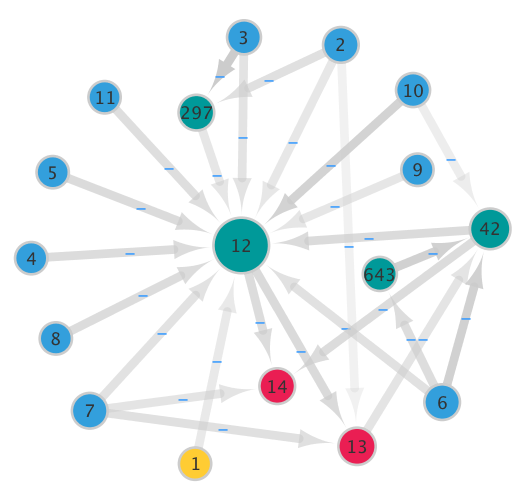 Mean Complexity is an average complexity (number of nodes + number of links) of best organisms per epoch for all epochs. 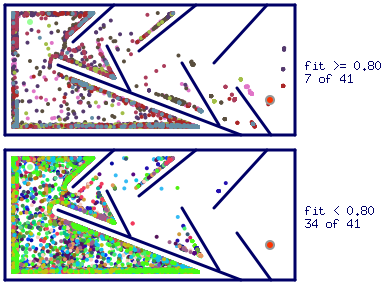 After 64 generations was found near optimal winner genome configuration able to control maze solving agent and find the exit with spatial error about 1.9% at the exit point. The artificial neural network produced by this genome has only 16 units (neurons) with three hidden neurons. During the experiment novelty search optimization resulted in growing two additional hidden units (neurons) and introducing recurrent link at the output neuron #13 (angular velocity effector). The recurrent link at that output neuron seems to have extreme importance as it's introduced at each winner genome configuration generated by solution. It seems reasonable because neuron #13 effects steering of the agent and need to learn more complex behaviour than neuron #14 (linear velocity control). It's interesting to note hidden neuron #91 which seems to learn complex behaviour of steering to the maze exit when it is detected rightward or behind of the agent. We've made such assumptions because of its connections with input sensors #2, #7 (range finders: RIGHT, BACK) and #10, #11 (radar sensors: BACK, RIGHT). The hidden neuron #293 connected with input sensor #11 (radar sensor: RIGHT) learned to affect agent's steering in the direction of maze exit as most of the times it is at the right bottom relative to the agent. The hidden neuron #12 which is introduced in seed genome operates as main control-and-relay switch relaying signals from sensors and other hidden neurons to the effectors (neurons #13, #14). Above is a rendering of the maze solving simulation by agents controlled with ANNs generated from genomes of all organisms introduced into population until winner is found. The agents is color coded depending on which species the source organism belongs. The fitness of agent is measured as a relative distance between it's final destination and maze exit after running simulation for particular number of time steps (400 in our setup). The initial agent position is at the top-left corner marked with green circle and maze exit at the bottom-right marked with red circle. The top plot shows final destinations of the most fit agents (fitness >= 0.8) and bottom is the rest. The results is given for experimental run with winner genome configuration presented above. At that experiment was produced 32 species among which the most fit ones has amounted to eight. After 109 generations of population was found near optimal winner genome configuration able to guide maze solving agent through hard maze and approach the maze exit with spatial error of 2.5%. 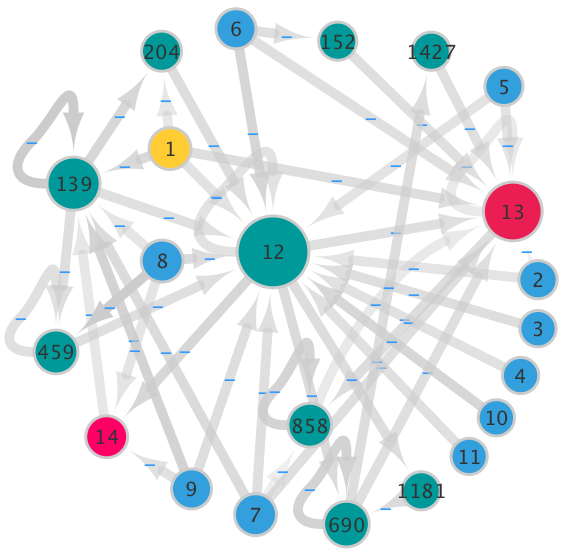 The artificial neural network produced by this genome has only 17 units (neurons) with four hidden neurons to model complex learned behaviour. The optimal genome configuration produced by growing three additional hidden units and multiple new links compared to seed genome. It's interesting to note that recurrent link at output neuron #13 (angular velocity effector) was routed through two hidden neurons in contrast with medium maze where neuron #13 was simply linked to itself. This may result in more complex behaviour learned especially taking into account that link pass through neuron #42 affected by range finder: LEFT and radar: BACK. The neuron #42 also affected by connection with neuron #643 (affected by range finder: LEFT). As a result we may assume that it learned how steer agent when maze exit is behind and wall is at the left of it, i.e. to follow the left wall by moving forward. Other important point to note is about possible learned behaviour encoded by hidden neuron #297 - it's affected by input range finder sensors detecting distance to obstacles at RIGHT and FRONT direction. Looking at maze configuration we may assume that this neuron learned to avoid left chamber trap with extremely strong local optimum of fitness based on the distance to the maze exit. 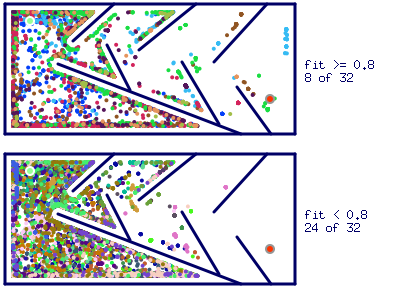 Above is the visualization of hard maze solving by all agents until winner is found. The initial agent position is at the bottom-left and maze exit at the top-left of the maze. The agents is color coded based on species they belong. So, each dot of similar color is the final position of agent controlled by organism belonging to the same species. The top plot shows final destinations of the most fit agents (fitness >= 0.8) and bottom is the rest. The fitness of agent is measured as distance from it's final position to the maze exit after 400 time steps of simulation. From the plot we can see that winner species produced organisms that control agents in such a way that its final destinations is evenly distributed through the maze. As a result it was possible to produce control ANN able to solve the maze. In this experiment evaluated the performance of maze agent controlled by ANN which is created by NEAT algorithm with objective-based fitness optimization. The mentioned optimization is based on maximizing solving agent's fitness by following its objective, i.e. the distance from agent to exit. As with previous experiment the behavior of a navigator is defined as its ending position in a maze. The fitness function is then the squared Euclidean distance between the ending position of the agent and maze exit. The effect of this fitness function is to reward the solving agent for ending in a place as close to the maze exit as possible. After 248 generations of population was found near optimal winner genome configuration able to guide maze solving agent through medium maze and approach the maze exit with spatial error of 1.8%. The artificial neural network produced by this genome has 22 units (neurons) with nine hidden neurons to model complex learned behaviour. The genotype of the winning agent presented above has more complicated structure compared to the near optimal genome created by Novelty Search based optimization from the first experiment with more redundant neurons and links. Due to added complexity, the produced organism is less energy efficient and harder to execute at the inference time. By comparing it with simulation based on Novelty Search optimization it may be seen that agent's final destinations is less evenly distributed through the maze space and some areas left completely unexplored. Where: ./data/maze.neat is the configuration of NEAT execution context, ./data/mazestartgenes is the start genome configuration, and ./data/hard_maze.txt is a maze environment configuration. After 10 trials objective-based optimization function was unable to produce any successful hard maze solving agent. The hard maze has deceptive cul-de-sacs, where objective-based fitness function has strong local optima. Thus when neuroevolution is based on this fitness function it's unable to make a leap to the next level of genome complexity able to solve hard maze deceptive traps. At the same time novelty search based fitness function was able to produce maze solvers able to crack hard maze configuration with the same ease as medium maze configuration. Above is renderings of hard maze solving agents' final destinations for several failed trials. For all 10 executed trials the renderings looks similar and by examining them it can be easy detected mentioned local optima traps which prevent any produced organism from solving hard maze configuration. In this work we have tested two approaches to perform fitness function optimization with NEAT algorithm: novelty search and objective-based. The novelty search optimization was found as outperforming method for solving of deceptive tasks when strong local optima present, such as maze solving. Our experiments based on two maze environments configurations: medium and hard maze. The novelty search optimization also resulted in producing more energy efficient and elegant genome for solver agent. The absolute winner with NS optimization has only 15 neurons with 19 links between (Fitness: 0.984) compared to objective-based optimization where best agent has 60 neurons with 214 links between (Fitness: 0.987). The provided fitness value describe how close final agent's position to the maze exit after 400 time steps (where 1.0 means exact match). Full statistics of experiment provided further. With hard maze configuration objective-based optimization method failed to produce any agent able to solve this maze. At the same time Novelty Search based optimization is able to avoid deceptive strong local optima introduced in hard maze and produce effective solver agents in less than 300 generations over the same ten trial executions. As it was shown by experimental data, the Novelty Search optimization, where fitness of agent is based on novelty of the solution it was able to find, considerably outperforms traditional objective-based optimization and even was able to solve task where traditional method failed completely. We believe that novelty search optimization can be successfully applied to produce optimal solving agents in many areas where strong deceptive local fitness optima is blocking traditional objective-based methods from finding optimal or any solutions. During this project development was created several tools to help with results visualization and pre-/post-processing. Allows to visualize recorded data of maze solving agents color coded by species they belong and separated into two groups: the best and other.